Quit your job – The time is now! Bosses should expect a sharp uptick in being told where to stick it, as job-quitting season is about to dawn. 1. Today’s unemployment data show the trend in unemployment is finally pointing downwards. The first time since 2012. Today’s data were kind of big news. Of course, the unemployment rate fell a lot in March. All the way down from over 6 per cent to 5.8 per cent. So much that it seemed like statistical noise. The fact April has given the same result is amazing. This means – maybe – you can quit your job and the unemployment rate gets better while you look for a job, not worse! 2. Unlike last month, this result is driven by a lift in full-time jobs, which rose by 14,000. 3. Unlike recent years, the improvement in the unemployment rate is not caused by fewer and fewer people bothering to look for work. The movement in the participation rate this month was rounded to zero. 4. 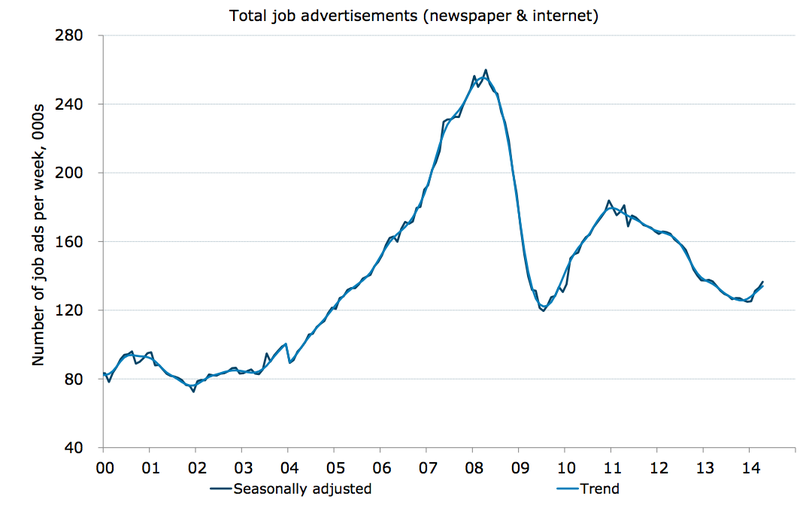 The number of new jobs being advertised is on the up and up. For most of the past few years, Seek.com.au has been an ever more arid wasteland. But now it is starting to blossom with opportunities. In each of the last four months, the number of jobs advertised in Australia has risen – that’s the best positive streak since 2010. Get amongst it. Don’t feel bad about quitting your job. It could be good for the economy. This paper suggests you probably will self-select out of a job where your productivity is relatively low. The US even tracks the number of people quitting jobs as a measure of confidence. And if you’re looking for a job, remember, advertised jobs are just the tip of the iceberg.